Most people believe that cooking is all about the ingredients and the ability to combine them. They frequently ignore the importance of using reliable utensils, such as kitchen knives. A quality knife, although expensive, will not only guarantee that you will have all the ingredients ready in no time, but will also make the whole cooking experience much more pleasant. Because let’s face it – who wouldn’t want to get dicing of onions over in the blink of an eye? So Expensive Knives Look After Themselves? Can You Put Quality Knives In The Dishwasher? You want to look after your investment – as well as being expensive, your knives become so much a part of you, you are so used to them, it feels like they are an extension of your hand. Not to mention the fact that, despite common belief, a sharp knife is less dangerous than a dull one. The dull one is more likely to slip off the food and hurt you. After you’ve realised the importance of a quality kitchen knife set and decided to invest in a high-quality one, you have to learn how to take care of it. Especially since you’ve probably spent a considerable sum on it. Whether they are Global, Miyabi or Zwilling J.A. Henckels, your kitchen knives are sensitive tools and they must be cared for properly if you want to use them for a long time. Look after your investment! No – Buying expensive blades doesn’t mean that you can forget about regularly sharpening them or that you can leave them in the sink for hours or place them with the other cutlery, and they will be just fine. You have to respect your knives and take care of them and, in return, you will be able to enjoy their precise and sharp cut for years. First of all, you must sharpen your knives twice a year if you use them frequently. You can do this at home, using a knife stone or honing steel, or you can take them to a professional, who will do it for you properly, without affecting the blade. Secondly, you should never leave your knives in the sink with other utensils. It is very dangerous for the person washing the dishes. Also, it can also lead to the blades scratching or bending. It is recommended that you wash and dry your knives as soon as you’ve finished using them. Putting them in the dishwasher is also a very bad idea for your kitchen knives! They can easily scratch against other utensils, damaging the blade. Some manufacturers claim that you can wash their knives in the dishwasher, but you should still avoid it if you want to use your knives for a long time. Storing your blades is also extremely important: keeping them with the other utensils will cause scratches; therefore it is better to store them separately, while also using a knife sheath that will guard the blade. Other options are in a knife block. One may have come with your knife set. You can now get nifty magnetic knife storage racks. And another good choice is a block that has fibres inside, rather than just a slot. 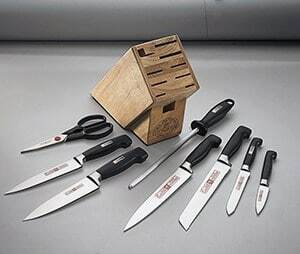 Another essential aspect in caring for your knives is the surface you use for cutting. You might find it easier to cut directly on your counter top. But you should know that solid surfaces are too hard for the blade. Instead, make sure you always use a cutting board that is made of wood, bamboo or plastic. Glass and porcelain can also be damaging to the blade. Lastly, if you need to transfer chopped food from the cutting board to pot, bowl or pan, use the back of the knife. Using the sharper edge can make the blade dull over the long term and also scratch it. Once you understand how much easier a good knife can make your life (or, at least, your cooking), you will want to be as gentle and caring with your blades as possible. It is, after all, a relationship based on mutual respect. When you care for them properly and they will guarantee you will always chop your food faster and also have fun while you do it. Interesting article, thanks for the tips on how to care for your knives. They are an important part of your kitchen. Taking care of these good knives is another great investment as well as purchasing them. Hi Linda – that’s a good point – that the care of your knives is an investment, as much as the purchase – thanks! I’m showing this article to my husband. I do not put my knives in the dishwasher and he thinks that ridiculous and a stupid rule. I’m constantly taking them out of the dishwasher after he uses them and hand washing them. Hope that works for you Elizabeth! Thanks for the helpful article! I always handwash my good knives. The dishwasher soap will etch the metal handles as well. For a quickie sharpening before I use them, I run them at an angle on the unglazed bottom of a ceramic mug. I always like a really sharp blade. I haven’t heard about using a ceramic mug before Quinn! Once you’re used to a really sharp blade the difference becomes unacceptable – doesn’t it? Thanks for your comment. Thanks for the tips! I too have always hand-washed my kitchen knives. I run it under hot, hot water and give it a quick scrub with a cloth. It does the trick and the faster I get the knife put away, the better I avoid needing stitches from a cut. LOL! Hi Tim, That’s a great habit to create – and yes, much safer than having such excellent cutting implements lying around, that could accidentally cause us an injury. Thanks for the reminder that we should respect the knives and in return they will give you years of excellent service. I used to always get told off by my mother for not drying the kitchen knife when finished so the habit of keeping them clean and dry has always stuck with me. Hi Bailey – it’s funny the way we actually do remember what our mothers told us! Good to hear! It’s always great to hear of quality purchase lasting a life-time with good care – I’m sure yours will. Better value in the long run, especially if you get a good price on a quality set! Thanks – Bec. Thanks for all the great tips! It’s so important to take care of our knives so they cut properly. Absolutely – most people come to think of their quality kitchen knives, as an extension of their hands – worth looking after them so we can have them for a lifetime!